US Secretary of State John Kerry gave Israel an ultimatum Saturday, threatening the country with international boycotts if peace talks fail. 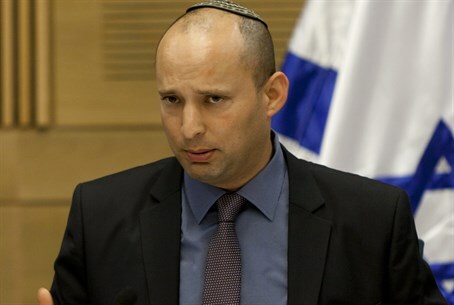 Economics Minister Naftali Bennett responded to the threats, declaring that Israel will never submit to economic threats. "I want to clarify to all those giving advice: a country has yet to be born that will give up its land because of economic threats, and we won't either," stated Bennett. "Only security will bring financial stability, not a terror state next to the Ben Gurion Airport." Kerry's threats of boycotts follow earlier reports indicating Kerry himself is orchestrating European boycotts on Israel. "We expect our friends in the world to stand by our side, against the anti-Semitic boycott attempts against Israel, and not to be the voice of the boycotts," remarked Bennett. "We've known in the past and know today how to stay strong." Indeed, recent research analyzing various factors including military and economic capabilities found Israel to be the 10th most powerful country in the world. Bennett's statements against friends of Israel threatening the country followed Deputy Defense Minister Danny Danon's words Saturday night, in which he said "we will not hold talks with a gun to our head. Friends don't put ultimatums on the security of the state of Israel." Housing and Construction Minister Uri Ariel responded similarly to Kerry's threats. "The only things that are an illusion are the slogans of peace that Kerry is trying to sell to the state of Israel. Slogans that cover the existential danger to Israel. The Palestinians can't believe how lucky they are to receive such a 'fair' mediator."